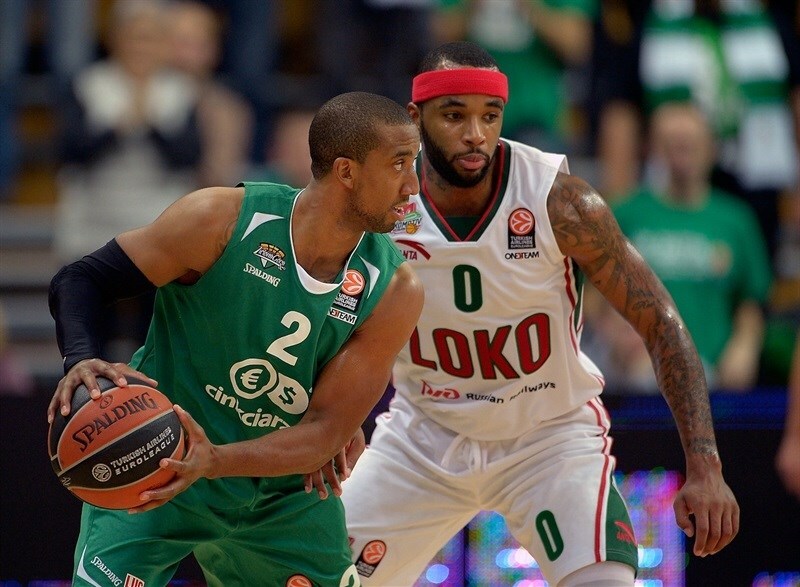 Lokomotiv Kuban Krasnodar remained undefeated in Group C after beating Stelmet Zielona Gora 75-83 on Friday night in a game that was closer than the final score indicates. The fourth quarter alone featured eight lead changes and seven ties. In the end, Lokomotiv held the hosts without appoint for the final 90 seconds, while Chris Singleton scored a key basket with two minutes to go, Dontaye Draper made a decisive steal and Malcolm Delaney sealed the game from the line. The result lifted Lokomotiv's Group C record to 3-0 and saw Zielona Gora fall to 0-3. Delaney starred with 25 points and 5 assists, Victor Claver added 13 points and 8 rebounds and Ryan Broekhoff scored 12 for the winners. Vlad Moldoveanu and Dee Bost scored 16 each for Zielona Gora, which was undone by its 19 turnovers. 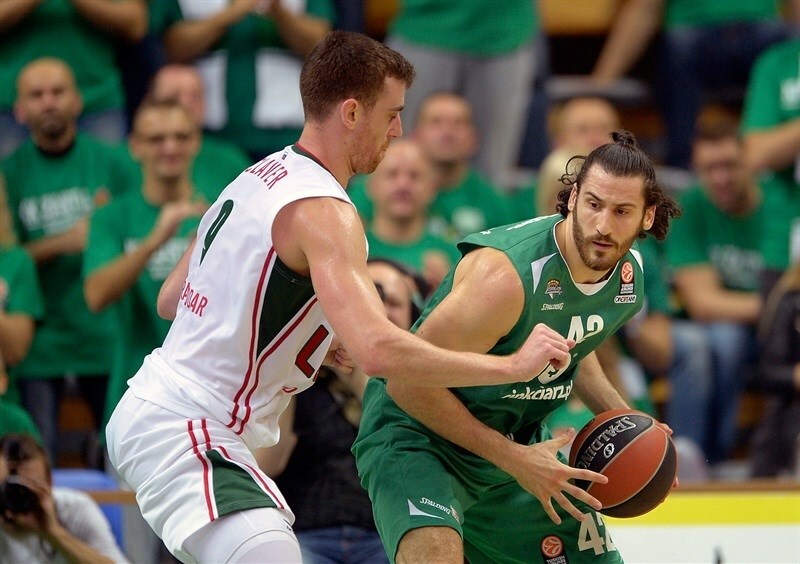 The hosts opened the scoring when Dejan Borovnjak passed out of the high post to Moldoveanu for a layup. 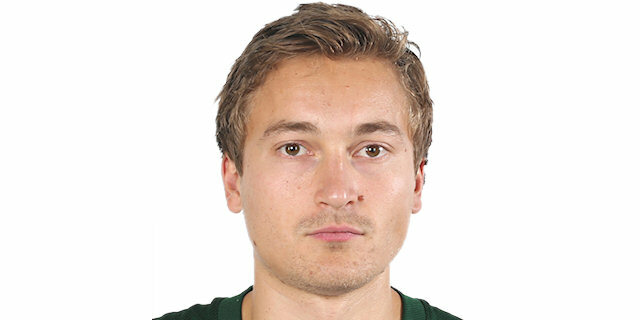 Broekhoff scored Lokomotiv’s first points from behind the arc. Mateusz Ponitka and Borovnjak made free throws for a 5-3 start. Evgeny Voronov scored on the break to tie it, but Moldoveanu responded from downtown. 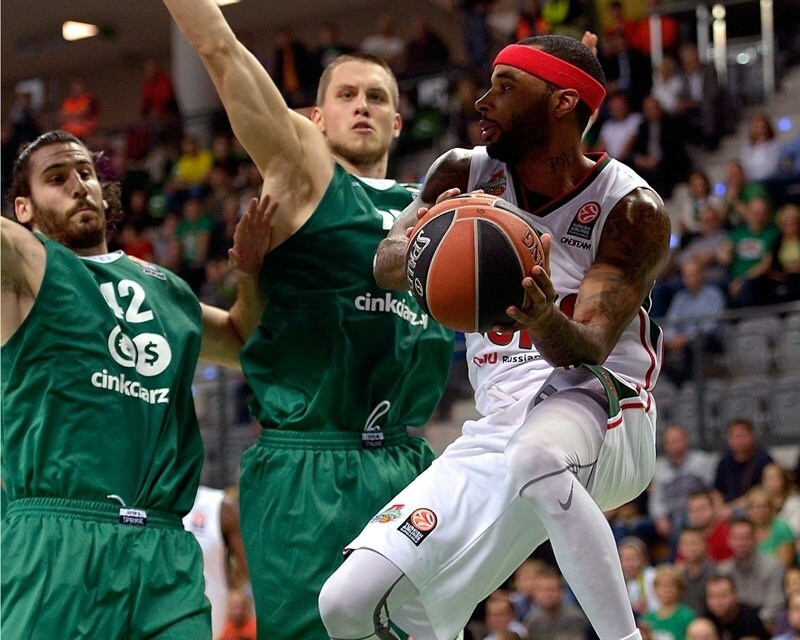 Turnovers plagued the visitors, but Zielona Gora did not capitalize. 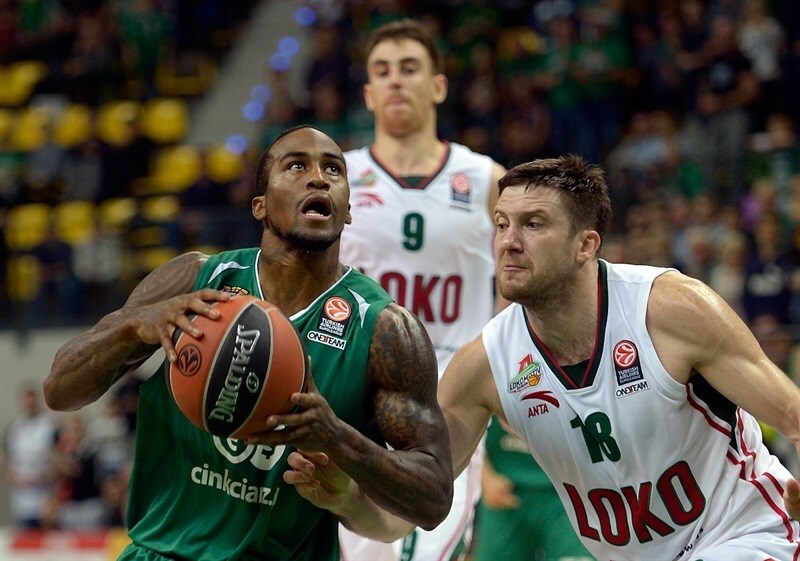 Dee Bost darted through the Lokomotiv defense for a layup that made it 10-5. Andrey Zubkov’s triple kept Lokomotiv close. Delaney’s long pass led Sergey Bykov to a fast break layup-plus-foul that tied the game at 11-11. Moldoveanu drew three players in the post and then spotted Ponitka for a two-handed slam, but Delaney countered with a bank shot. Bost drew a foul with 3.7 seconds left in the quarter and netted the free throws to give the hosts a 15-13 lead after 10 minutes. 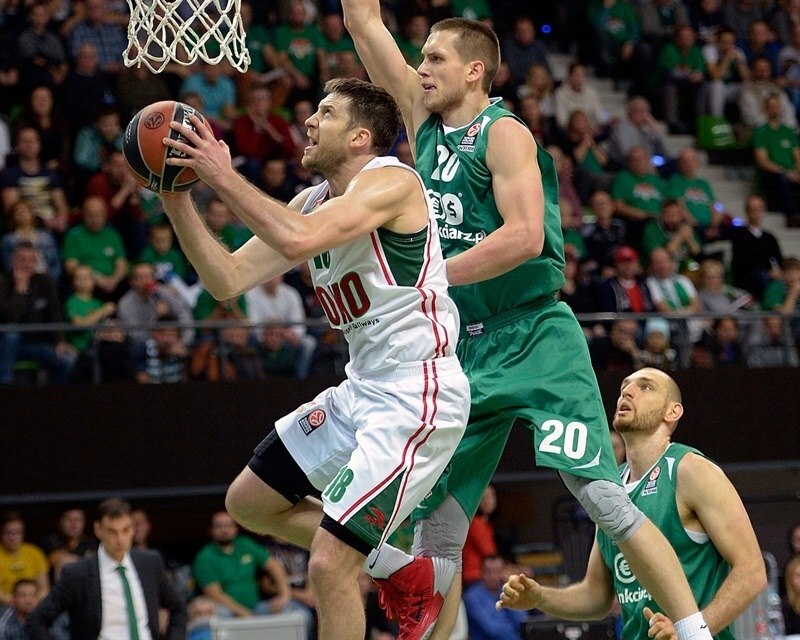 Victor Claver buried a three from the corner for Lokomotiv, but Adam Hrycaniuk countered with a long jumper. Przemyslaw Zamojski pulled up in transition for a three-pointer and foul for a 21-16 lead. Voronov kept the Lokomotiv attack running with a jumper before Dontaye Draper’s steal and layup brought the visitors within 1. Zamojski sank his second three to put the hosts ahead 24-20. Chris Singleton drove inside, drew a foul and closed the gap to 2 from the line, but Lukasz Koszarek replied with foul shots. Claver rocked the rim with an amazing two-handed slam, but the momentum stayed with the hosts when Nemanja Djurusic sank a triple. 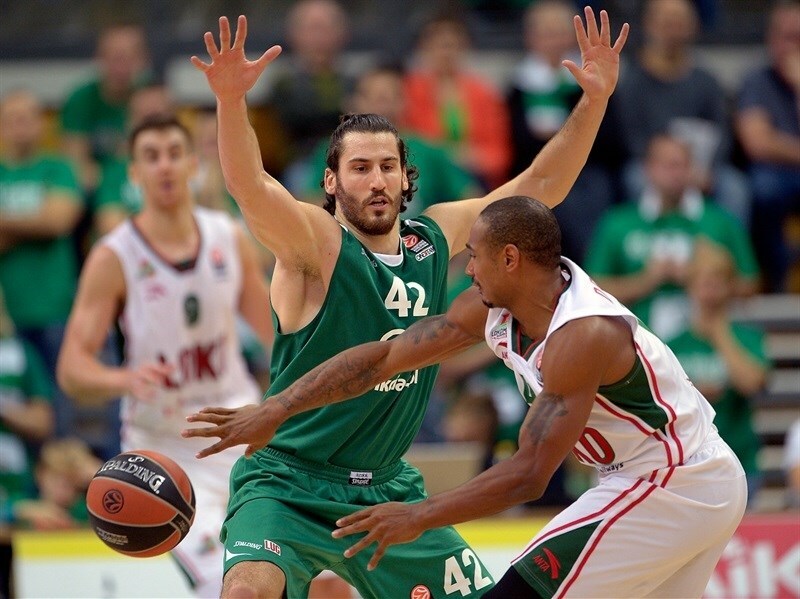 However Draper and Delaney set each other up as Lokomotiv closed to 29-28. After a timeout, Draper stripped Kopszarek and scored an uncontested layup. Koszarek answered immediately, but Delaney buried a three-pointer and then a no-look, circus shot and foul to make it 31-36. Moldoveanu connected from downtown, but Singleton’s free throws kept the visitors ahead. Aleksey Zozulin’s unsportsmanlike foul on Moldoveanu led to 4 points from the line for the latter and a tie game at 38-38. 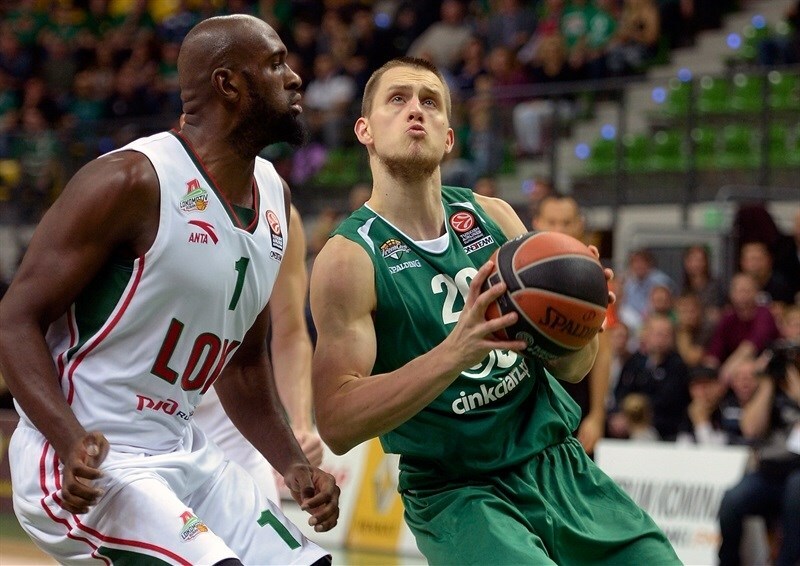 Claver found Zubkov for a short jumper and a 38-40 halftime lead. Claver’s steal led to a Delaney layup to start the second half. Moldoveanu banked in a shot in the post, but Broekhoff countered with a three. Ponitkza scored a pair of tough baskets inside before Borovnjak;s jumper put Zielona Gora ahead 46-45. 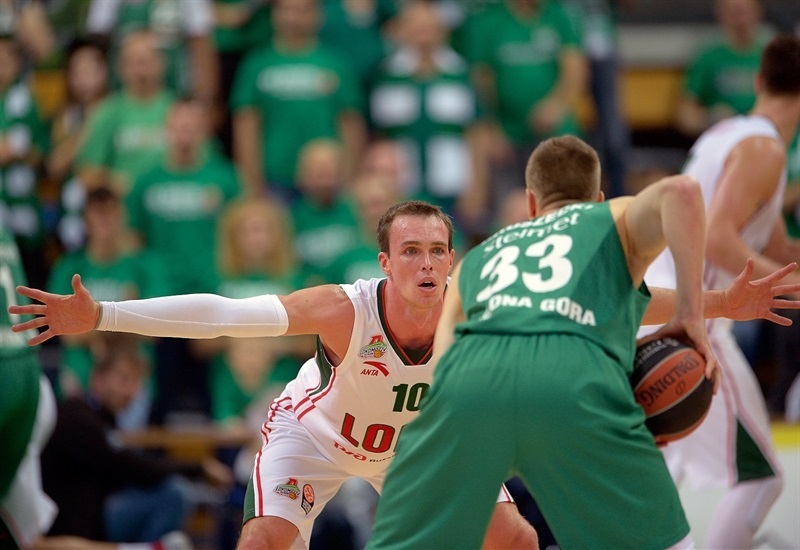 Lokomotiv responded quickly with Claver’s basket-and-foul and a Delaney triple off a missed free throw. Voronov drove for a tough shot at the other end. Free throws by Claver made it 48-54 midway through the quarter. Borovnjak and Claver traded shots before a TV timeout allowed both teams to regroup. However, after the stoppage, neither team scored for two-plus minutes until Zubkov split free throws to make it 50-57. Bost connected twice from the line and after Zamojski stole the ball from Draper, Szymon Szewczyk followed it up for the tip-in. 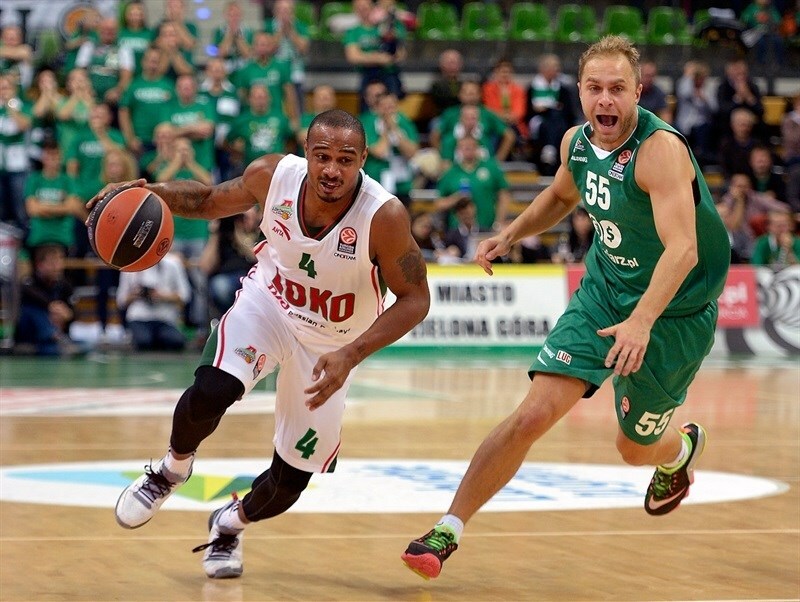 Bost scored a short jumper in transition as Zielona Gora got within 56-57. 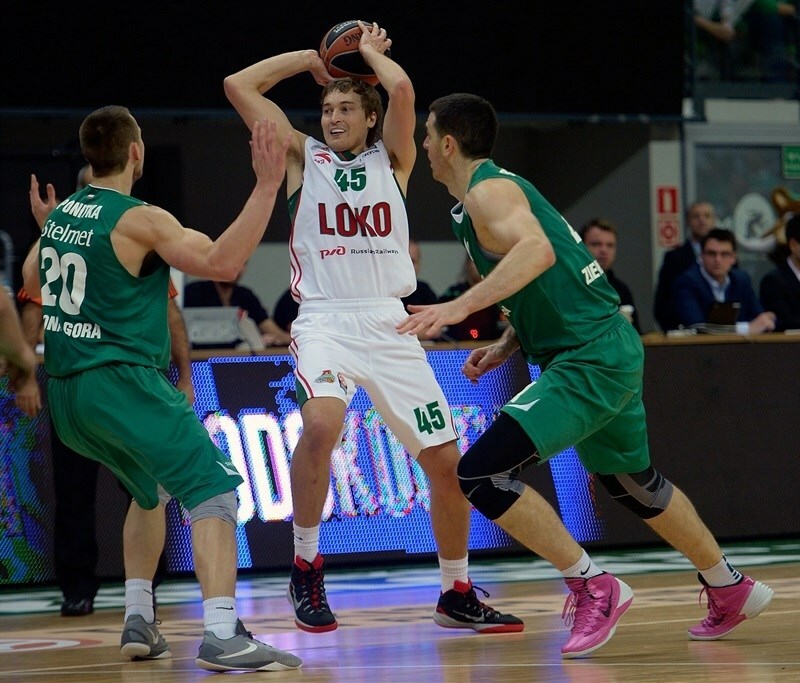 After free throws by Bykov and Bost, the quarter ended at 57-59. Delaney broke loose for a layup and foul, but then fouled Bost, who converted a three-point play. Szewczyk stepped up when he took a lob pass from Ponitka for a basket-and-foul and then rattled in a three to give the hosts a 65-62 lead. However Broekhoff came up with a three-and-foul on the next play. Bost was fouled on the break, landed on his back and lomped off. His replacement, Koszarek, made free throws for a 67-66 edge. Delaney split shots at the other end to tie it with five minutes to go. Singleton found a cutting Broekhoff for a layup. Ponitka and Voronov traded free throws. Bost returned and buried a triple for a 72-71 lead. Delaney put the visitors back ahead from the line. Moldoveanu turned an offensive rebound into 2 free throws only to see Delaney bury another jumper. Singleton’s effort for a loose ball paid off with a layup for a 74-77 lead with two minutes remaining. J.R. Reynolds split free throws for the hosts. It came down to late free throws and Voronov split shots up 2 with 17 seconds left and a chance to ice the game, but Draper stole Ponitka’s pass and split free throws to put the game away. "What can I say? Three good games and three losses. Why? Tonight we had a lot of mistakes and turnovers. Nineteen turnovers in game versus Lokomotiv is too much. 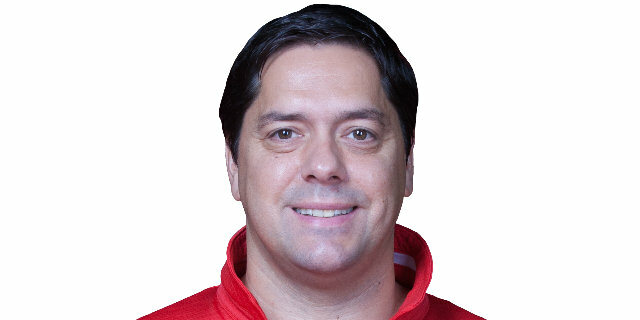 Thank you to my players, congratulations to Lokomotiv. We fight on." "It was very good game. The fans in Zielona Gora are incredible. For me it is an important win. Saso Filipovski has good players. I am surprised that they haven't won a game yet in the Euroleague. Thank you to my players, it was important for us to have three wins in three games." "We believe in ourselves. We work hard and have confidence in our abilities. We just made some mistakes at the end, just a couple of plays, same as the last couple games, one or two plays at the end can cost you the game. They're a good team. Everyone knows that. They have some talent, some ex-NBA players, and they have Delaney, their engine, their motor, who makes them go. Tonight, we just couldn't stop him." "Very tough atmosphere. The fans were into it, Stelmet made some big plays. We were lucky enough to make some free throws when we needed to and get defensive stops. We were able to get some steals and some easy buckets and that was the difference in the end. So a very big win for us. We're very happy. Every game is going to be very tough. Although we're 3-0, we have to worry about the next one as every game is very, very important."